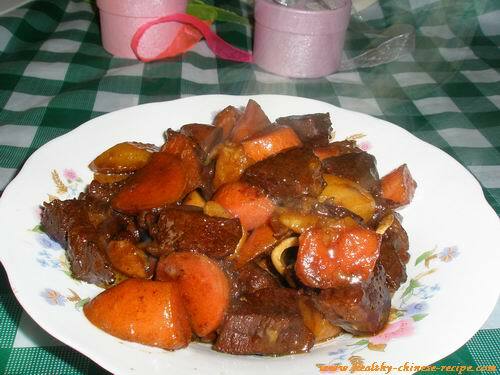 These Braised lamb recipes are different from that of western cuisine.in Chinese cuisine, especially home cooking we cut them into small blocks. All flavors can be cooked into the meat. These Braised lamb recipes are different from that of western cuisine. Whether it is lamb shrank, lamb leg, lamb chop, or lamb shoulder, in Chinese cuisine, especially home cooking we cut them into small blocks. Stir fry meat blocks in oil, seasoning and sauce, then simmer. Because it's small blocks, all flavors can be cooked into the meat. Here I'll show two braised lamb recipes. One is Shanghai style, and another is Xinjiang style. 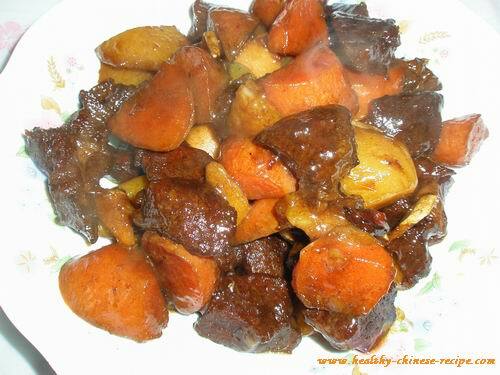 Shanghai style cuisine is featured by deep brown color by heavy soy sauce and sugar. Xinjiang style is featured by tomato and cumin, which westerners love. 1. Wash lamb leg, cut into bite size blocks. Wash carrot, peel potato, cut into the same size of lamb. Soak potato blocks in cold water. 2. Boil lamb blocks in cold water. Wash, remove dirty water. 3. Heat oil in a wok, Add lamb blocks, stir fry 5 minutes, or till brown color. 4. Add Seasoning and Sauce. Stir fry 5 minutes and simmer for 5 minutes. 5. Add 3 cups of hot water. Bring to a boil. simmer for 60 minutes. 6. Add carrot and potato blocks, stir fry 5 minutes. Add 2 cups of hot water and salt. Bring to a boil. Simmer for 30 minutes, till cooked and thicken. 7. Arrange on a plate, serve warm with steamed rice or bread. 1.During simmer, it's more delicious if you add hot water in several times. So if you are diligent enough you can add hot water one cup, and then add another cup when it's almost dry. 2. If you don't like light sweet you can only add 1 tablespoon sugar. Function: This dish is good to those who have cold-related disease such as cough caused by coldness. Diabetics don't eat as it contains sugar. Heart disease and obese people don't eat too much, 2 or 3 blocks of lamb meat is enough.